Today marks the beginning of the week when Christians tell the story that is central to our faith. It begins with Jesus' entry into Jerusalem, and continues with his arrest, trial and death. Then comes the resurrection. In terms of our emotions, this story takes us as if on a rollercoaster. Roller coasters are endless loops, yet there is a beginning and an end. We rise to the peaks and traverse the valleys; whilst the drop from the highpoints may distress and trouble us, the spaces in between to allow us to catch our breath. Some roller coasters have sections which are dark and scary. The roller coaster offers an image for the liturgical year. Liturgically, the church begins our ride on the first Sunday of Advent, with the slow climb towards the top of the first big hill – Christmas. We descend through Epiphany into Ash Wednesday and the contemplative period of Lent, before we begin to climb again towards Palm Sunday. From there we descend into the darkness, before climbing into the daylight that is Easter. Next there is the rush of Pentecost, followed by the quieter Sundays of Ordinary Time, when we may catch our breath, and look around at the scenery. Once we have passed the last hills of All Saints' Day, Christ the King Sunday, the ride is over. So we look forward, once again, to the First Sunday in Advent. 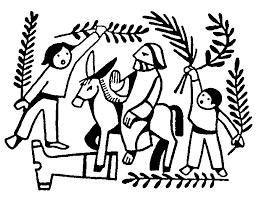 Today is Palm Sunday, a peak in the journey, that we encounter before we get to Easter. It's a moment of joy and excitement – a peak from which we will descend into deep places. We look at each other, ask hard questions about betrayal, and eat last meals. This darkness and struggle is a central part of the Easter journey, because, if we are to scale the heights, we must also experience the depths.